Can I Apply Heat To My Wig? Home > Wig Help and Advice > Can I Apply Heat To My Wig? One of the biggest drawbacks to owning and wearing a wig is the fact that the hair remains in one style day after day, wear after wear. So, the question most wig owners want the answer to is if they can apply heat to their wig and Style Their Own Hair. Can I Apply Heat to Style My Wig? The best answer to this questions is no. 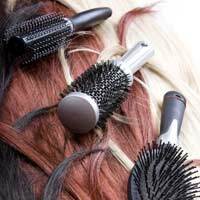 Synthetic Hair Wigs can become frizzed, burnt, and damaged by the heat, and most human hair wigs are already over-processed and can become more damaged by the added heat. If you must have the look of waves, curls, or body added to your wig, it is best to leave the process up the professionals, who have the proper tools, techniques, and knowledge available. If possible, you should always take your wig into a hair stylist or wig specialist to change the style and add curl. That being said, if you do not have the time or money to run to a stylist every time you want a change in hairdos, there are a few special circumstances that will allow you to apply heat to your wig at home. If you plan to curl your own wig, you must first make sure that you own the proper curling iron. Make sure it has the lowest possible heat setting. Usually the least expensive curling iron will be the one with the lowest temperature output but always read the packaging label to make sure. You must also make sure that you use a technique designed to minimize the curling iron's damage on the hair. If you are curling a synthetic hair wig, mist the hair with water before styling since the hair strands are made of plastic or nylon and can melt easily under high heat. The water will provide a barrier to high temperatures. If you have a human hair wig you can skip this step (for more information on real and synthetic wigs, read our article The Difference Between A Real Hair And Synthetic Wig in this section). Next, you will need to place another barrier, such as a thin cloth or a piece of tissue paper (the papers that come in home perm packages work great for this) between the hair strands and the barrel of the curling iron. This material will help distribute the heat, lower the temperature, and protect the actual hair strand. Finally, when applying the curling iron to the hair strands you will want to use a gentle touch. Do not tug on the hair strands or place too much pressure on the clamp of the curling iron. Once you have the hair wrapped around the barrel, keep the hair strand moving across the heat source. If you allow the hair to stay against the barrel for any period of time, it can damage the hair strand. As an added layer of protection, you may want to purchase a heat protecting styling product if you plan to curl your own wig frequently. Specially formulated products are available that will help protect your wig from the heat and condition it during styling so that the hair won't melt or frizz during curling.